Best of Rajesh Rajoo: Pirate Jack Sparrow! Will You Be Back? Ugh! That was absolutely insolent of me. Captain. 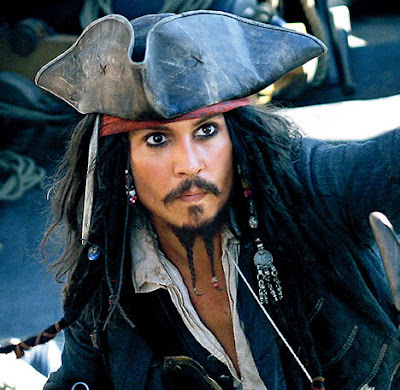 CAPTAIN Jack Sparrow it is. And I'll never get that wrong again. I'm this late bloomer, if that's the word. I get everything backwards. I miss out on a lot of things and then before regret buries me alive, I indulge to save my soul. What was that saying again... better late than never. Touché! I love Captain Jack Sparrow. Don't you too? That was a legend waiting to happen. Pirates have always amused me. But the spectacle on celluloid was something beyond my wildest dreams. I'd like to kill myself for not having watched the Captain on the big screen. Pirates of the Caribbean: The Curse of the Black Pearl is a masterpiece. I haven't enjoyed a movie so much in a long time. (Excuse me while I flagellate myself for not seeing it on the big screen). I didn't like Pirates of the Caribbean: Dead Man's Chest as much though. But it's fascinating never the less. The characters are so real. And the Captain... oh well, he didn't shine as much as he did in the first story. If you haven't seen the movie yet, rush to get yourself a DVD, even a pirated one like I did for Dead Man's Chest! These pirates are a contagious breed. Imagine! I got myself a pirated DVD to watch Pirates of the Caribbean: Dead Man's Chest. Haaaaa! Excuse me, that was a joke I told myself. But there’s something that bothers me: When Captain Jack falls off the cliff still tied to the bamboo pole after escaping from the cannibals, he is clearly falling towards water. But when he hits the ground he is in a jungle! And then when Elizabeth tries to head for the gun in order to shoot the gunpowder and rum barrels, she tries to climb stairs (right before Captain Jack takes up the gun). Suddenly, the ship is hit so hard that Elizabeth falls down. The gun, however, does not move at all. Did I miss something? Never mind. Everything's forgiven when it's a mind-blowing experience.